The EVAN-Society is a non-profit organisation founded by EVAN members to further promote the goals of Virtual Anthropology in Europe and worldwide. Its main goals are to maintain and build up further relations between institutions working in Virtual Anthropology, to continue developing the EVAN Toolbox and Archive, and to provide access to these European infrastructural measures and related information and documentation. EVAN (the European Virtual Anthropology Network) was a EU-funded project (FP6 Marie Curie Actions MRTN-CT-2005-019564, 2006-2009) with the goal to train and educate a new generation of young researchers in Virtual Anthropology (VA). This interdisciplinary science focuses on studies of anatomical variability in humans, their ancestors, and their close relatives and integrates physical anthropology with medicine and new morphological analysis methods from biomathematics, computer science and bioengineering for the purpose of applications in the academic, clinical, industrial, and private & public research sectors. 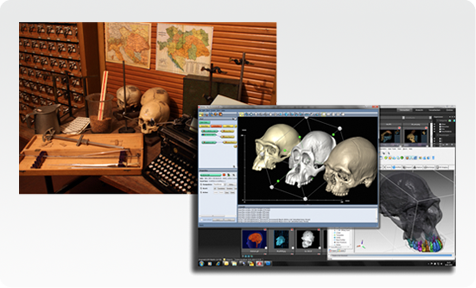 It uses medical imaging and other 3D-digitisation approaches, computer visualisation, software programming and modelling for application areas as diverse as hominoid development and growth, evolutionary biology, human origins, early detection of diseases, orthodontics, planning of surgical intervention, forensics, biometric identification, Rapid Prototyping, and teaching. EVAN also built two lines of VA infrastructure: A software to facilitate form and shape analysis of biological objects (EVAN Toolbox – ET), and an archive to provide 3D volume and surface data of such objects (EVAN Archive).